Join the movement that’s transforming the state’s culture-based educational systems. Editor’s note: This is the final installment of a three-part series on language and education in Hawaii. Read the first installment here and the second one here. Māui-a-ka-malo, more commonly known as the Hawaiian Superman, was a superman not because of his magical feats but because he did them in pursuit of creating a better society. As the preeminent changemaker across the Pacific, Māui engineered societal shifts focused on efficiencies, innovation, and re-distribution of authority and knowledge. We can still see the echoes of those ancestral traits in those today who have committed their lives to making the same sorts of powerful shifts in our education system. It is likely, however, that many haven’t noticed these changes unless they are connected to education. Hawaiian Culture-Based Education is transforming how we approach educating children here in Hawaii and abroad. 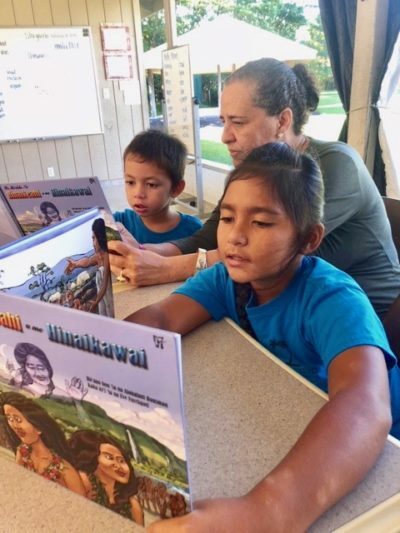 Hawaii has achieved notable success among worldwide indigenous language revitalization efforts. Such successes have been hard earned through three decades of efforts to establish and sustain Hawaiian-language kula kaiapuni (immersion schools) and efforts in preschool through university-level contexts (e.g., Pūnana Leo, Department of Education kula kaiapuni, and UH System Hawaiian language programs). The latest shift, which began almost two decades ago, includes Hawaiian-focused charters developing and expanding educational programs from a Hawaiian-based foundation. 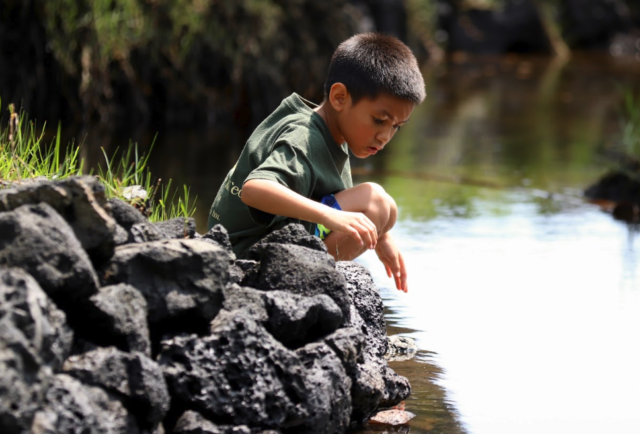 An elementary school student from Ka ʻUmeke Kāʻeo Public Charter School doing STEM work at Haleolono Fishpond in Keaukaha. Having been involved with HCBE for the last 17 years as support staff, a parent, and now as the principal of Ka ʻUmeke Kāʻeo Hawaiian Immersion Public Charter School in Keaukaha, I’ve been in a prime position to experience and contribute to these changes. The impact of HCBE is multifaceted. HCBE schools have been powerful community change agents. One such area involves schools growing strong, skilled community members. HCBE schools have looked into their own communities to fill their staffing needs, investing in and growing their faculty and staff to successfully meet their new roles. Through professional development and career pathway opportunities for community members, HCBE focused schools have strengthened communities and schools simultaneously. Adding significantly to the momentum of such efforts, the DOE has recognized the importance of HCBE, implementing its Nā Hopena Aʻo framework across Hawaii’s public education system. Kamehameha Schools campuses have recently adopted aligned E Ola! learner outcomes and are requiring two years of ʻōlelo Hawaii for its high school students. Many schools, public and private, have adopted the practice of morning piko, where students open the school day together offering pule, oli and mele that connect them to their place, each other, and a shared commitment to care for their communities. HCBE schools are also leading the way in educational assessment, adopting hōʻike or authentic performance-based assessments rooted in hands-on experiential learning that looks beyond unidimensional desk work and test scores. These approaches to learning place Hawaii on the front line of a national movement in that direction. For example, HCBE programs have expanded the classroom beyond its four walls, transforming field trips into complex, long-term research projects. Much of our ʻāina-based learning gets students out of the classroom to learn science, math, language arts, and critical analytical skills from community practitioners, all while building their relationships with place. Such innovative educational approaches have moved many schools across Hawaii to see the value of connecting students to their communities and communities to their schools. Such experiences are transformational–learning becomes relevant, memorable, and identity-forming. Students grow enduring roots in ‘āina and communities. They develop their social and environmental consciousness and become committed to a lifestyle of sustainability. In a time when we are faced with critical environmental challenges and divisive political rhetoric, rebuilding our connections with the land and with our communities is the only way forward, and this is the heart and soul of an HCBE education. Too often our focus on traditional Hawaiian values and connections to ‘āina are seen as living in the past. HCBE is the future. It is the way that we can address so many of the problems that face us as a people and a planet. Too often our focus on traditional Hawaiian values and connections to ‘āina are seen as living in the past. But what HCBE is really calling for is a return to past practices of stewarding Hawaii and the world for future generations. We must ensure that those leading HCBE schools who are showing our keiki what it means to live for the future have adequate resources to make it to that future. So in this coming election season, be like Māui-a-ka-malo, the Change-Maker, and vote for those who would support the future we need, the future we deserve, and then hold them accountable after they are elected. Olani Lilly is the Poʻokumu of Ka ʻUmeke Kāʻeo a Hawaiian language immersion charter school located in Keaukaha on the island of Hawaii. The foundation of the educational program is Papakū Makawalu.